Friday night, 194 seniors will graduate from LaRue County High School. As in years past, organizers expect a packed house of relatives and friends in the gymnasium, but a new air conditioning system should help keep everyone cool. Doors open at 6:30 p.m. for the 8 p.m. ceremony. No reserved seating; handicapped seating will be available. Valedictorian Hannah Canter, daughter of Gary and D.J. Canter, and salutatorian Chelsie Morrison, daughter of Nathan and Sarah Graham, will speak to the crowd. The City of Sonora will purchase the former Sonora Elementary School building. The Hardin County School Board voted May 21 to sell the building that formerly housed Sonora Elementary to the town government. Sonora placed two bids for the building, one for $43,000 that would be paid at the closing of the deal, and one for $45,000 that would be paid in $15,000 increments. The School Board unanimously chose the $43,000 bid. Taekwondo is a great way for kids to exercise, even adults. Kids who are not enrolled in taekwondo have trouble staying fit. Sallee’s Family Taekwondo is a wonderful place for kids and adults to make friends, have fun and just be themselves. There are lots of great activities, to keep you in shape, kids and adults will be exercising and having fun at the same time. It looks like tobacco growers will have to hold field-ready transplants for a few days or more this year. Often this coincides with periods of humid cloudy weather. Densely packed plants in a humid environment is a recipe for big problems. Below are some suggestions for holding plants until field conditions improve. Maintain a low level of fertility: Reducing fertility levels to the 25 to 50 parts per million nitrogen range will slow growth and reduce the amount of rank green leaf material that may be more susceptible to bacterial rots. The Governor’s Office of Agricultural Policy will hold a regional workshop Thursday, May 28, at the Hart County Extension Service in Munfordville. The workshop begins at 9 a.m. CDT and is one of 11 workshops that GOAP will hold to discuss new policy and program changes of the Kentucky Agricultural Development Fund. GOAP’s compliance team, area project analysts, and others will discuss all new policy changes, as well as, changes concerning KADF programs, including the new on-farm energy investment area and the County Agricultural Investment Program. Monday’s meeting of the LaRue County School Board turned heated when an audience member asked one of the board members to resign. Donna Miles and Penny Van Dyke, both of Hodgenville, addressed the board during the “audience comments” portion of the meeting. My husband and I moved here to Hodgenville last October. We have found that we like this little town very much. One of the things we found here is the Senior Citizens Center. It is a very beautiful building, but it takes more than a building to make people feel like they belong. This may be the best-kept secret in LaRue County but I want to tell you about it. Monday through Friday, we are served a delicious hot meal at noon just for a donation. We have met some wonderful friends there, people we would not have come to know had it not been for the center. I would like to thank the newspaper for showing my story. I would also like to thank all the businesses that let me place my fliers. Finally, I would like to thank all the people who donated devices. We had a great turnout. Thanks to you, many pounds of harmful chemicals will be kept out of landfills. 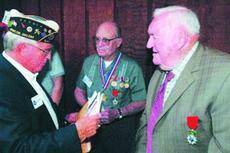 Two area World War II veterans received French Legion of Honor medals for helping defeat Germany. Blond H. Puckett and James Calvin Sarver received the honors May 14 before a group of family and fellow vets gathered at Pritchard Community Center. Dave Jarrett, a veteran service officer for Disabled American Veterans, worked with the French Consulate in Chicago on the presentation. Those who receive the award – which Napoleon established – are considered knights of the French Republic. University of Louisville coaches and athletics staff members will make six regional stops, including a visit Wednesday evening in Elizabethtown, as part of the annual Cardinal Caravan. "This eighth annual event allows us to reach out and show our appreciation to those that support our programs throughout the year," said Tom Jurich, director of athletics at U of L. "Our staff enjoys the opportunity to share some time up close with so many loyal Cardinal fans around the region."